One of the most powerful insects in the world is the hornet. There are close to 20 different species of hornets known worldwide. Hornets are not a native insect to North America. However, overtime one species has made its way across the Atlantic and now is active all across North America. It is the Vespa Crabo, or commonly called the European hornet. While this is the only true hornet found in North America, many types of wasps are given the same title due to their similar body shape and size. The most common wasp to be identified as a hornet is the Dolichovespula Maculata, which has been given the name Bald Faced hornet despite being a wasp. The European hornets are typically 1 to 1.5 inches in length and have six legs and two pairs of wings and have a predominately reddish color. This is in contrast to the Bald Faced hornet which has a similar body style but features more of a black color with yellow markings. Like bees, hornets rely on living in a colony that is growing from a healthy queen. In the early spring the queen will lay eggs, watch them hatch and gather food for them until they mature. When the young hornets have reached adulthood they will find roles to fill to help the colony grow. This could be building the nest, protecting the nest and gathering food. This cycle continues until the temperatures become too cold for survival. All females of the colony are sent out to establish new nests while the remaining queen will start again the following year. Any remaining male adult hornet will die during this time. European hornets build their nest by building a paper like structure that can house the hornets at night and allow new hornets to grow safely. This is accomplished by adult hornets collecting small pieces of wood and mixing it with their saliva to build up the structure. The nest is typically built above ground so this may mean an attic, roof overhang, tree branches or another place that is out of heavy traffic. The hornets will make sure the nest is built in such a way that it is protected. While hornets traditionally seek to avoid interaction with outside threats, they will aggressively defend and protect their nest. If a human comes into close contact, whether on purpose or not, they are viewed as a threat to the colony. This reality poses a real risk to homeowners that have a hornet nest on their property. They eat a combination of sugar from flowers and plants and protein that they find from other insects. 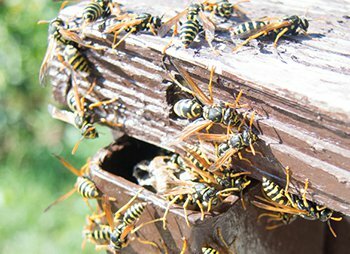 This can help reduce the amount of pests you may find in your yard or garden because the hornets are keeping the population in check. They make for a great natural pesticide. However, this means that the population of hornets near your home is growing in number, which can lead to more interaction for you and your family. Treatment of this insect can pose quite a risk to homeowners. Due to their aggressive nature in protecting their nest pursing your own treatment plans can result in physical harm. Depending on your situation it may be best for you to hire a professional who has the knowledge and protective equipment to handle this nuisance. Contact us today to learn how we can help you with this issue.